BlackCat Petting Cat!To love cats more! SuiNekoKan. Ltd. has released an iPhone app “Touch the Cat’s Numbers”. Aim for speed or kittens? 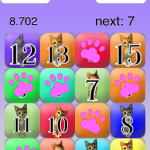 SuiNekoKan has released an iPhone app called “Touch the Cat’s Numbers”. This is our 14th iPhone application and it’s designed to show you the cuteness of cats. ■Appealing points! Must enjoy them! Follow the numbers or compete for speed! Want a warm feeling? Then chase the kittens! There is more to life than achieving the goals. But watch the kittens with love otherwise you can’t enjoy their confusing behaviors completely. “Touch the Cat’s Numbers” will help you liberate your mind from the busy life and heal you. It also works as a brain training such as widening peripheral vision or quickening the reflexes. Moreover you have to face making an agonizing choice. Aim for speed or follow the cute kittens. Either way, you will be able to refresh yourself by playing with those cute kittens. You can also have great cat chat by posting to Twitter. “Fast” action and “cute” action usually contradict. Especially when it comes to kittens. We found out what is necessary to enjoy this contradiction with a simple concept. 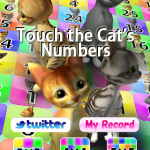 We pursued to contain kittens’ cute behaviors, meow and colors for “Touch the Cat’s Numbers”. The more you play, the more you must forget about the result of the game and find yourself relaxed. 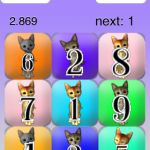 A programmer who teaches iPhone application development asked us to add a cat image to his simple speed game in which the user has to touch the number as fast as he can. We thought only adding a cat image on it wouldn’t be interesting enough. Cats have to be cute. And they need to have realistic movements. How can we make them move cute and attractive? Usually users compete for speed in this kind of game. However, when SuiNekoKan releases an app, we want the users to love our adorable cats. We came across a word that our friend in New York and her husband invented: Tabbymometer. Tabbymometer is a concept that measures “how much you love cats”, and we came up with a perfect essence of the game that your affection for cats contradicts speed. Thanks to this concept, we finally could create a game in which you can enjoy the cuteness, no matter how you play. We are so grateful to our friends who gave us the idea. Of course, we also express our gratitude to our programmer who was patient enough to accept our repeated requests of modification! We are happy that we finally deliver this ultimately cute game to you. Since our staff also enjoyed working on this project, we’re already planning new projects such as cats wandering from the game screen or reacting to the human voice. We get started developing another cat application that you can play along with music and sounds. Anyone who loves cats, stay tuned! Info by: SuiNekoKan.ltd (The word “Neko” used in our company name stands for “Cats” in Japanese. Our mission is to tell the world about the cuteness of cats and pleasure sharing life with them). This cat is a hybrid between house cats and wild African Servals. It is said that the ancestor of these cats was a type that was beloved by the King of Siam and was never allowed outside. 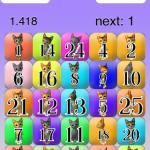 This is a reversi board game with active kitty cats. 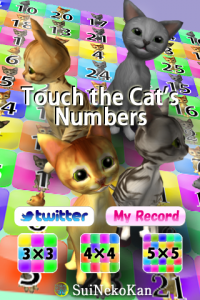 The first-ever “reversi game” with 3D kitty cats has been finally released! Real 3D cats run around and sit on the board by themselves, behaving like reversi pieces. Up to 64 cats can get around for you! What is Cats Reversi 3D?